12-Cup Coffee Maker Just $33.99! Down From $100! PLUS FREE Shipping! You are here: Home / Great Deals / Amazon Deals / 12-Cup Coffee Maker Just $33.99! Down From $100! PLUS FREE Shipping! 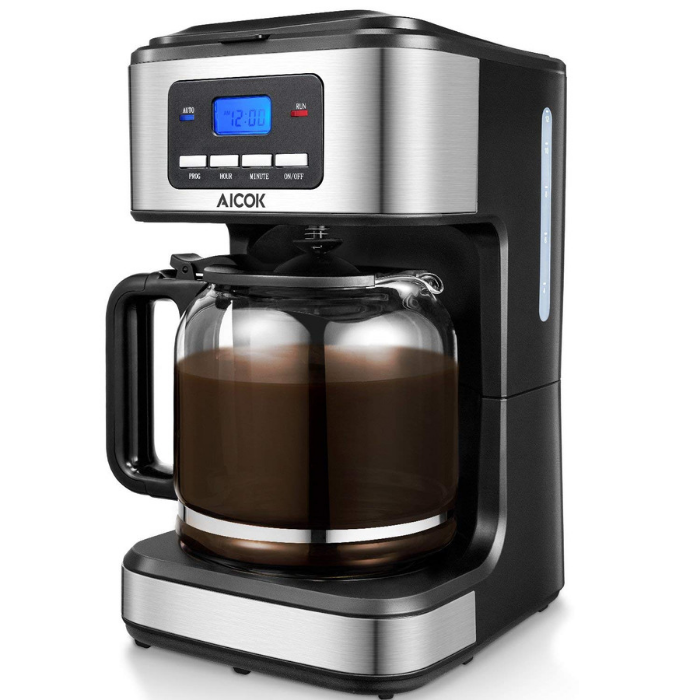 Amazon has this 12-Cup Coffee Maker on sale for only $33.99 down from $99.99 PLUS FREE shipping! 24 HOUR PROGRAMMABLE TIMER: Wake up to the smell of freshly brewed coffee, automatic coffee maker with the programmable timer that let you set the coffee machine start to brew 8 minutes before you wake up. Immagine that a warm coffee in a early cold winter morning. BREW/PAUSE AND KEEP WARM FUNCTION: Easy to Brew in the best temperature. Pause anytime the brew to get the urgent caffeine fix. Warming plate can also keep your coffee at the perfect temperature up to 6 hours. When finished working, it will automatic shut off after 2 hour. DURALIFE GLASS CARAFE: Stainless coffee maker with strong glass carafe contains up to 12 cups of coffee and employs an easy-grip handle for comfortable, no-drip, pouring. A large-capital carafe allows you not only to enjoy, but also to share in a big party. MESS-FREE SERVING: Filter basket for coffee filters is easy to remove for fast filling and cleaning, while the transparent water level window shows the water in the reservoir, ensuring you never overfill the machine. Triple Guarantee: 2 years warranty for 10 cup coffee maker; We provide lifelong technical consultation and customer service; BPA free material for water tank and UL certification, give you a powerful safety guarantee.Packaged in gift box,suitable for gift giving.